You’ve experienced it before, right? That first bite of an “energy” bar, where you are just hoping that this will be a good one. It won’t be dry, or heavy on the protein flavor. You just want some quick, balanced calories, and prefer it be eatable without tasting like chocolate dirt. And once again, you’re let down. Maybe you can’t bring yourself to throw away the rest of that horrible chunk of “food” so you choke it down, counting down the bites until you never have to eat it again. This really should not be the experience one has when eating food designed to fuel a grueling workout. And honestly, when I’m training hard, taste is the last thing I care about in the nutrition I take. I view it as more of a bonus than anything. But woah, sometimes you just can’t eat the crap that’s out there. The texture is terrible, or its super dry and crumbly, and other times, just tastes terrible. When I’m on the bike training I almost exclusively take in Infinit for my calories. My body likes all their products, it has a good balance of everything I need (and is even customizable) and the cherry on top is it tastes very good, even when warm. And when I’m racing, I take it exclusively, usually sticking with Go Far for big races. It just works. Every once in a while though, I’ll do an all-day-epic type of ride and want a little variety, or I grab something walking out the door. Sometimes I’ll try a bar of some sort, and have found some interesting products out there. Pro Bar for instance, is a solid option, albeit fairly dry in your mouth. But, it tastes decent enough and has a great diversity of nutrients. Honey Stinger has some unique products and their waffles are delicious, which helps overlook their lower calorie count and crumbly nature. However, there doesn’t seem to be a perfect balance though. And when I’m at home before a ride looking for a quick boost, rarely would I turn to any of these products because they just aren’t worth it. I’ll make an almond butter and honey sandwich (which takes longer admittedly but at least it tastes great) or something else that’s quick. Enter: Trail Nuggets. A few months back I heard about heard about these little bars and brushed it off as another Colorado creation that was bound to disappoint me. I forgot about them entirely until I saw a box on sale at the Rodeo Labs site. I decided to pick up a variety box and check them out. When I got them (quickly I’d add), the packaging popped out at me immediately. Fun, colorful, well designed, but best of all, VERY EASY to open! That is a must for any ride food. I’m not sure if they have other flavors than these three. The ingredients are solid, as are the sodium and fat content. It packs a 210 calorie punch and is pretty small for such a good number of healthy calories (which I prefer as it makes eating take fewer, faster, bites). After my initial scan, so far, so good. Mmmm. It was a soft bar, almost brownie like, and wow! Very tasty. I kept chomping away and before I knew it, I polished off my first Trail Nugget. I ate another one, a different flavor, and again, really good! I was impressed. I went back two days later to taste another one. Maybe after the dust settled from my first test, I could find some flaws. I tried the Beet flavor this time, assuming of any of them, that would be the worst. And I was wrong, it was fantastic! The softness of the bar is perfect, not too mushy to get crushed in a jersey, but soft enough to be moist in your mouth for a change of pace from traditional energy bars. The taste pops, and stands out as unique but still delicious. I love it. I even got my wife's dietetic approval after inspecting the nutrition facts! So there we have it, Trail Nuggets ARE worth it! And I'd say they are great for a quick and healthy snack at home, work in the car etc. I definitely will be eating them elsewhere. Check them out, give them a try, and let me know what you think. If you’ve had them, leave a comment below with your feedback. I’m interested to hear what others think of this new bar. Big kudos to Rodeo Labs for developing an amazing product. 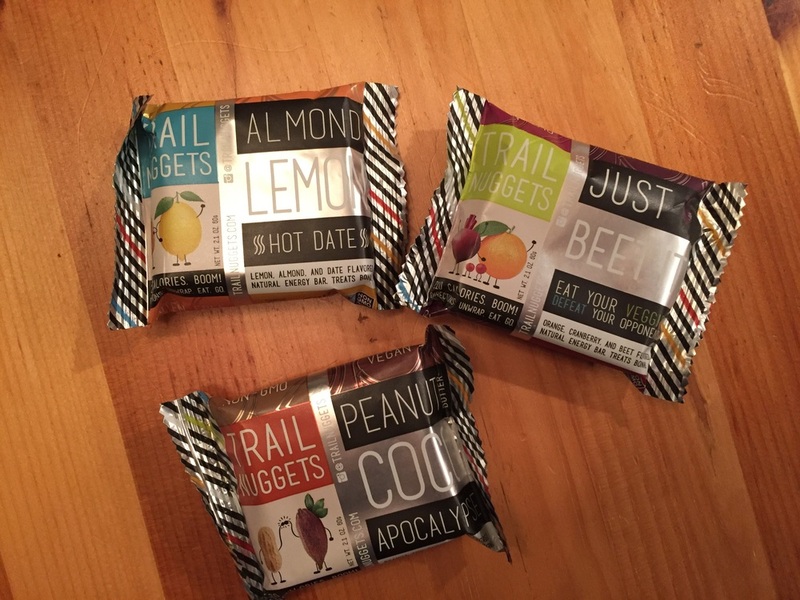 Get some Trail Nuggets HERE.